The Forests and Oceans for the Future Research Group at UBC consists of faculty, students, and community members who are interested in identifying meaningful solutions and policy alternatives to contemporary resource management problems. Our research group members are involved in projects that, while focused on north coast British Columbia, also include research in Alaska, the Fraser River, New England, Western Europe, and New Zealand. Morgan E. Smith, B.A., M.A. Cheryl Aman, B.Ed., M.A., Ph.D.
Paul Orlowski, B.Sc., B.Ed., Ph.D.
3) public education and extension products. 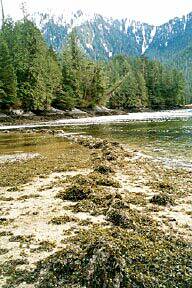 Since time immemorial, Gitxaała people have lived in their territories along the north coast of what is now called British Columbia. Gitxaała laws (Ayawwk) and history (Adaawk) describe in precise detail the relationships of trust, honour and respect that are appropriate for the well-being and continuance of the people, and also define the rights of ownership over land, sea and resources within the territory. However, since the arrival of the first K’mksiwah (Europeans) in Gitxaała territory in the late 1780s, new forms of resource extraction and expropriation have appeared which ignored, demeaned and displaced the importance of the Ayaawk and Adaawk in managing the territories of Gitxaała. The new industries (such as forestry, fishing, mining) have relied almost completely upon K’mksiwah science for management and regulation. During the last two decades, the value of traditional ecological knowledge (TEK), such as that reflected in the Gitxaała Adaawk and Ayaawk, has been increasing recognized. TEK tends to derive from a long history of sustainable resource use. It is cumulatively developed over many generations of local commercial and subsistence activities. TEK is dynamic, adapting and changing over time, and tends to reflect an integrated perspective on resources. TEK can provide highly detailed and specific information necessary for the successful management of local ecosystems. The results of our research group highlight the importance of local-level ecological knowledge in resource management. Furthermore, our results suggest that rather than macro-level planning authorities, resource management should be devolved to local level walps (and their equivalent in other First Nations territories) in conjunction with non-aboriginal people living within the territories. Involvement by individuals, agencies or corporations based outside the region should have a restricted role and limited access to resources and decision-making authority in the local arena.